Pepsi is now in the business of promoting leftist protest movement. 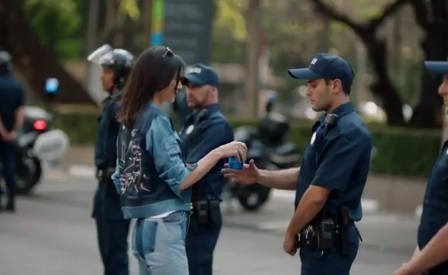 In the fantasy ad Kendell Jenner gives a police officer a can of Pepsi and the protesters start cheering. In real life they would have been chucking the Pepsi cans at the cops heads, bashing in the store windows and lighting the town on fire. At least they refrained from writing “Resist” on the buildings in spray paint. Thank you Kendall & Pepsi you have brought us all together despite our political views in hatred for your propaganda infused ad.